IT’S A PLAN as crazy as the situation is desperate – towing an iceberg from Antarctica to Cape Town to supply fresh water to a city in the grip of drought. Earlier this year, Cape Town came within weeks of shutting off all its taps and forcing residents to queue for water rations at public standpipes. The cut-off was narrowly averted as people scrambled to reduce their water usage and Autumn rains saved the day. But the threat is expected to return to the coastal South African city again next year and beyond. 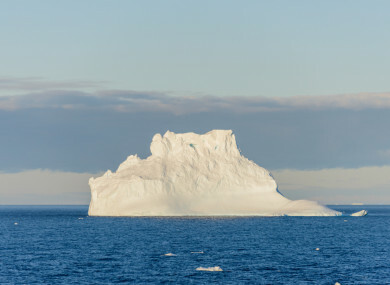 Sloane suggests wrapping the iceberg in a textile insulation skirt to stop it melting and using a supertanker and two tugboats to drag it 2,000 kilometres towards Cape Town using prevailing ocean currents. The iceberg, carefully selected by drones and radiography scans, would be about one kilometre in length, 500 metres across and up to 250 metres deep, with a flat, tabletop surface. Melted water could be gathered each day using collection channels and a milling machine to create ice slurry – producing 150 million litres of usable water every day for a year. Sloane’s idea might be dismissed as mere fantasy. But the 56-year-old Zambian-South African has a reputation for taking on the impossible after he re-floated the giant Costa Concordia cruise ship that capsized in 2012 off the Tuscan island of Giglio, killing 32 people – one of the world’s largest and most complex maritime salvage operations. “Icebergs are made of the purest freshwater on earth,” the founder of Sloane Marine Ltd said earnestly. He estimates it would cost $100 million (€86 million) to haul an iceberg on a journey that could take up to three months, and another $50-60 million to harvest the water for one year as it melts. “In Russia, they have pushed (icebergs) away from oil installations – but small ones, they are about half-a-million tons. (Here) we are talking about 100 million tons,” said Sloane. To tackle the drought, Cape Town has enacted measures ranging from building seawater desalination plants to issuing strict instructions to only flush toilets when necessary. But whether Cape Town authorities will be persuaded to embrace the iceberg project is unclear. “At this stage, it appears to us that in fact, the groundwater or desalination options are cheaper or at least equal cost price,” said Cape Town’s deputy mayor, Ian Neilson. There are also questions on how the water from the iceberg will be channelled into the city’s distribution system. Another problem is that there is no guarantee that by the time the iceberg is hauled to Cape Town, it will still be able to produce the promised volumes of water. Sloane’s plan is to tow the giant iceberg some 150 kilometres further north to South Africa’s St Helena Bay, where the cold Benguela Current keeps water at around zero degrees Celsius. Once there, the iceberg could be anchored in an old submarine channel, suggests Sloane. As the iceberg melts, water will be collected each day, pumped into tankers and driven to Cape Town. “It won’t sort out Cape Town’s crisis, (but) it will be about 20 to 30% of their annual needs,” said Sloane. “The project is crazy – no question,” said Olav Orheim, a Norwegian glaciologist with four decades of experience who is working on a similar project for Saudi Arabia. Never has such a large iceberg been towed – indeed, the towing of ice to supply drinking water would be a first – and it is unknown if it would withstand ocean currents or simply fracture in transit. But, said Orheim, it was no longer unrealistic “because we know so much more now than when we started this kind of research 40 years ago”. “It is a high-risk project, but also (one) which may have a very high reward at the end,” said Orheim. For Wolfgang Foerg, the chief executive of Swiss company Water Vision which has teamed up with Sloane, the project has huge potential in the face of ever more frequent drought. As for Sloane, he is ready for the green light. “If they tell us to go now, we can have it here by Easter (2019),” he said. Email “This plan could see an iceberg being towed to Cape Town to ease drought conditions”. Feedback on “This plan could see an iceberg being towed to Cape Town to ease drought conditions”.